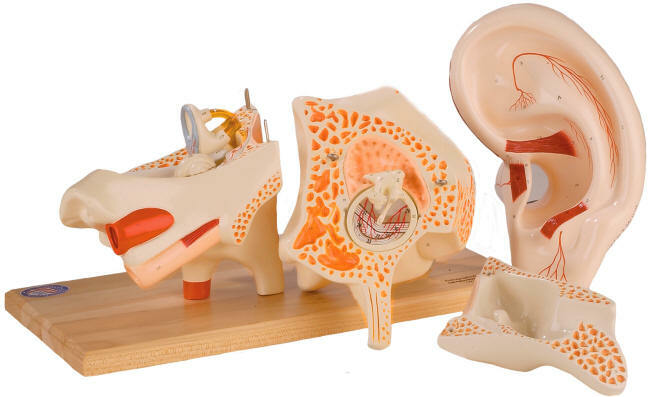 This anatomical model of the human ear is 5 times life-size. 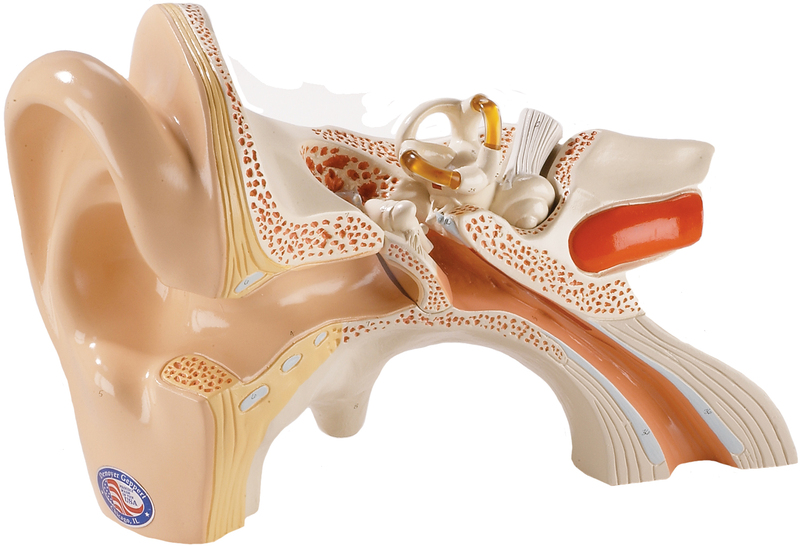 Made of an unbreakable polymer, this ear reproduction depicts the human organ of hearing and balance. Sagitally sectioned along the length of the auditory canal and eustachian tube, it is easy to trace the path of sound waves entering the ear and it becomes clear how pressure is equalized on the both sides of the eardrum. The entire middle ear chamber and the labyrinth is exposed to view. The malleus (hammer) and incus (anvil) and the attached see-through tympanic membrane lift out, as well as the entire labyrinth unit for hands on study. Two of the three semicircular canals are made of transparent tubing filled with colored fluid representing the endolymph. An air bubble in each will shift position when tilted, demonstrating the functions of the canals in maintaining equilibrium. A spiral cutaway of the cochlea shows its three canals in contrasting colors to teach the concept of pitch. 26 hand-numbered features. Please note: This is a hand made model, custom made to order. Please allow 4 weeks for delivery. 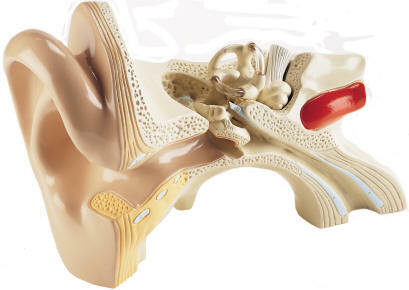 The same main mold was used to create this anatomical model of ear as the one listed above. However this ear does not have the transparent tubes used for demonstrating equilibrium, but is dissectible. The hammer, anvil, transparent ear drum and the labyrinth all lift out for detailed hands-on study. Functions of the 18 hand-numbered primary features are explained in detail in the accompanying student guide. 5 times life-size in unbreakable vinyl, our most detailed ear model provides a more complete perspective of the middle and inner ear structure with the temporal bone. All the skin has been peeled off the detachable auricle to expose its cartilaginous structure, muscles, auricular arteries and nerves, as well as the entrance to the auditory canal. Sections of the petrous and mastoid portions of the temporal bone can be lifted off to expose the middle an inner ear chambers. The tympanic ring with its see-through tympanic membrane and attached ossicles can also be lifted out. The extractable labyrinth is dissectible into three portions. Half of it, consisting of the semicircular canals and vestibule, demonstrate the sense of balance. Transparent tubing with colored liquid represents two of the semicircular canals. An air bubble in each will move with tipped, demonstrating the canals' function in equilibrium. The other half of the labyrinth, upon removal, shows the vestibular and cochlear nerves, which joint to form the auditory nerve. The cochlea itself separates into halves to reveal cochlear, vestibular and tympanic ducts and the branching of the cochlea nerve. 95 hand-numbered features are identified in the corresponding key. 17x 11 x 8 inches.